The first we thing we will do is add a new folder to the root of the project called “Views”. So go ahead and do that. After that right click the views folder and click “Add new file”. Click “iOS” and select a “Table View Cell”, name it “MonkeyCell”. My cell height is 130, we should remember this because we need it later. Now that we made the design and exposed our properties it’s time to bind them. Bind your items in the cell and make sure that you extend from MvxTableViewCell. We also want to download the image and display it. For this we will use the the DownloadCache and File plugin. The binding is as usual only we will bind our item inside the Action of the “DelayBind” which knows when to bind the items. That’s it for our MonkeyCell! The first we thing we will do is add a new folder to the root of the project called “Views”. So go ahead and do that. After that right click the views folder and click “Add new file”. Click “iOS” and select a ViewController, name it “MonkeysView”. We now should have a “MonkeysView.cs” with a “MonkeysView.designer.cs” and a “MonkeysView.xib”. Open the MonkeysView.xib and add a UITableView with the left/top/right/bottom constraints set to 0 so that it fills the whole parent view. 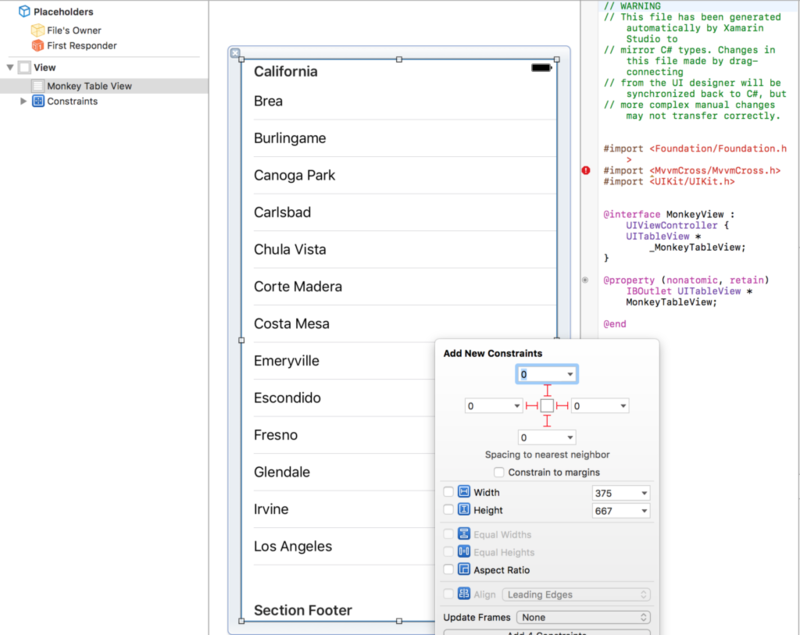 After that expose the property UITableView so that we can acces it in our “MonkeysView”. 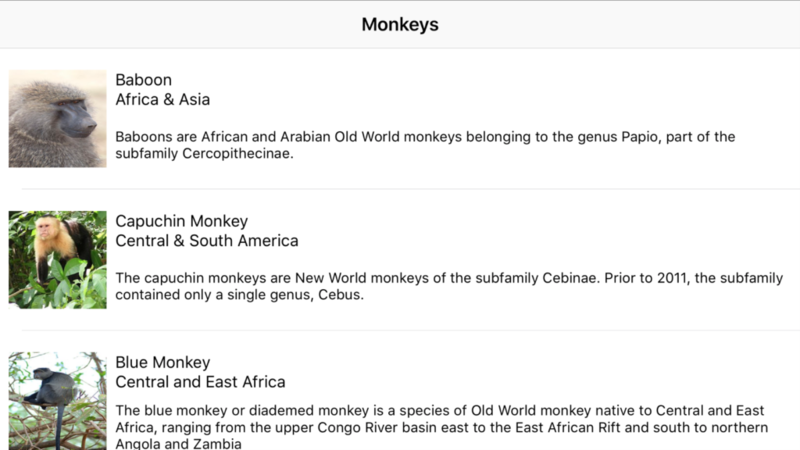 Now that we can access the UITableView we can bind our list of monkeys to the tableview source. In this post we will only use 1 type of cell, therefore we can use the MvxSimpleTableViewSource. If you have multiple types of cells you can extend the “MvxTableViewSource” and make your own implementation. 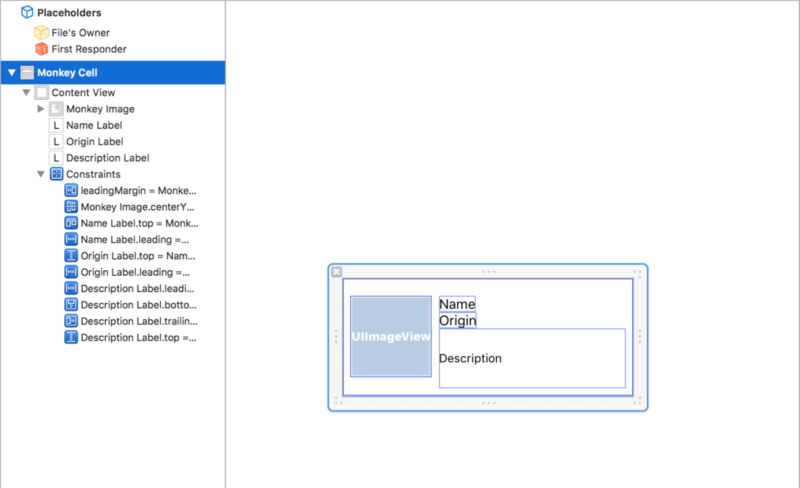 We will create a bindingset that binds our “MvxTableViewSource” to the “MvxObseravableCollection” in our ViewModel and set that as the source of our own “MonkeyTableView”. We should also set the 130 height of our cell here. That’s it, were done! If you run the application you should have a list of monkeys! If you have questions or you see a mistake that must be fixed, feel free to add a comment.